# Likely overestimate of APC and growth rate because mid grazing paddocks are estimated up to 600 kg DM above what we have visually assessed. APC and growth rates are over-estimated this week due to ongoing issues with the conversion of height measurements to mass using the c-dax. This week we implemented the new method of assessing pasture mass with the top 7 paddocks, as identified from the whole farm c-dax estimates, being plated and visually assessed as well. What this identified was that the mass in paddocks 12-18 days post grazing is being over-estimated by the c-dax and are therefore these paddocks are distorting the wedge and inflating the estimated growth rate. While the grass in these paddocks has height, there is no density or bulk to them and most are still at the 1.5 to 2 leaf stage and not ready to be grazed. However, we have noted an increase in growth and as such we need to speed up the rotation length and reduce supplement feeding in order to hit target residuals. The rotation length will speed up from 30 days to 24-26 days. Achieving a 24-26 day rotation will create some challenges as it will require some paddocks to be grazed over 1.5 days and others only 1 day. The feed wedge, days since grazing, knowledge of individual paddocks and pre-graze covers will be used to determine which paddocks will provide 3 grazings and which ones do two. A more conservative approach i.e. slightly longer rotation will be targeted with the LI farmlets as we are holding the next round of N until pre-Christmas to give the plants a boost post heading and going into summer. Nitrogen will continue to be used on the Std farms. Fodder beet will be sown into the crop-crop paddocks this week. 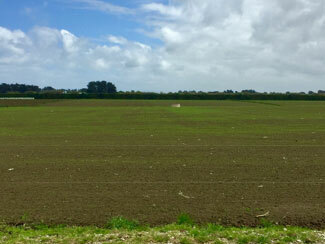 The paddocks have been power harrowed and had fertiliser applied. An assessment will be made on whether they require another surface work before they are planted. The grass to crop paddocks have been sprayed and have died off. They will be ploughed this week, rolled, levelled, power harrowed and receive fertiliser before being visually assessed and sown. The grass to kale paddocks will be sprayed out in the next few weeks with a target sowing of mid-November. The science tech team went for their annual body condition score (BCS) calibration this week. DairyNZ offers a BCS assessor certification programme of which you can become certified to confidently BCS cows to the standard of the NZ BCS system. BCS is an important tool used for making key on farm decisions and it is strongly encouraged that your herd is being BCS at key times throughout the season. Herd testing occurred this week which will allow identification of any new cows >200,000 SCC cows for bacto analysis. The samples are then sent to Hamilton so that we can further understand the extent of the Staph aureus issue in the herd. Pre-mating heats of the milking herds were assessed Friday morning, with cows already showing good signs of activity. The R2s received their first PG jab, with KMARs and their second jab scheduled for the 1st November. Following the second injection they will be AI mated for 5 days before being turned out with the bulls. A second mob of calves will be weaned after weighing and measuring this week. We are expecting approximately x40 calves to be weaned and sent to the support block. This new group of weaned calves will remain separate from the older weaned calves at the support block until they have finished their 7-10 days transition off meal. Two of the crop-grass paddocks had areas too wet to cultivate and sow when the paddocks were resown a couple of weeks ago. These were ripped this week and are drying out nicely. The new grass paddocks have germinated well and have a nice green tinge. This week x2 cows have been identified as culls. One will be inspected by the vet due to poor production and general ill thrift; the other will be culled due to udder confirmation and high SCC. One poorer calf will have a blood test taken this week. Farmlets are receiving bloat oil and MgCl through the dosatron. Each cow is receiving 10.5 grams MgCl per day. A proportion of each herd have been noted to have dirty tails and rough coats and many are the low BCS cows. The vets were contacted regarding the potential of an underlying internal parasite issue, options for determining this included: 1. Bulk milk test for ostertagia 2. Faecal egg count (FEC) of scruffy looking animals 3. Blood tests 4. Drench everything with Topline. It has been decided to do some FEC this week. The farm team have their Farmtune meeting next week. The Hub was lucky enough to have Makarewa School, with the support of The Plant Store team, out this week to get the first plants in for Stage 1 of our planted variable width buffer zone. Congratulations to Caitlin Crack on becoming a certified BCS assessor and Nicole S Hammond for passing her annual reassessment. To improve our ability to follow the cumulative effects of the different farm systems on the performance of the young stock the DairyNZ funded research project has decided to fund DNA profiling all the animals at the hub. While we ran separate springer mobs for kale and fodder beet herds this spring which guaranteed we knew the winter diet of the dam, we would like to be able to confidently know the dam of each calf.